Post news Report RSS	Catlateral Damage is now available on Steam! Get your paws ready, because you can now purchase Catlateral Damage on Steam! That's right! 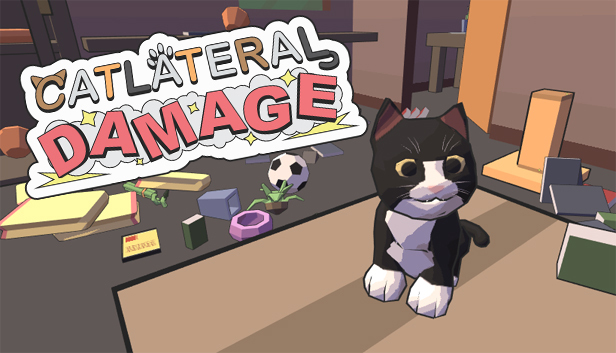 Catlateral Damage is finally out and available on Steam for Windows, Mac, and Linux! It will be $9.99 regularly but is currently 10% off during launch. There will also be a Humble widget on the game's website soon if you'd prefer to buy it there, and I'll also be adding a bundle on Steam that includes the game's soundtrack. The game's (almost) 2 year development has been fairly smooth but lots of fun. I'm excited to finally have the game out for everyone to enjoy! If you like the game, please leave a review on Steam and definitely tell your friends about it. The more people who pick up and enjoy the game, the more likely I'll be able to add more new content and features in the future! The awesomeness of this is beyond words. Well done. now you can wreck things, without wrecking anything!